It gets pretty quiet round these parts come August, and though Restaurant Week will keep some of you well fed from Aug. 14-20, a few spots will be quietly closing for vacation. 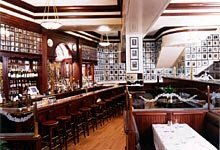 Most notably, Occidental (pictured) is closed now through November, as it renovates its kitchen in preparation for its 100th anniversary. Yes, folks, 100 years. Read about the restaurant's venerable past here, including the secret 1962 meeting between an ABC-TV State Department correspondent and KGB agent credited with sparking the resolution of the Cuban missile crisis. Also taking a short break is CityZen, which will close from Aug. 20 to Sept. 7. Maestro will also be closed Aug. 22 to Sept. 11. If you know of any others, leave them in the comments section. Nage (D.C.) will be closed for renovation the third week in August. cashion's will be closed from august 22nd thru sept 6th.